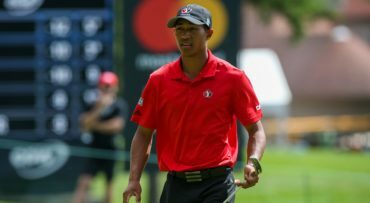 CHILE – Canadian Chris Crisologo escaped with his second consecutive South American Amateur title on Sunday at Los Leones Golf Club in Santiago de Chile. Crisologo successfully defended his title, obtained a year ago in Argentina after he defeated the Costa Rican Luis Gagne on the second extra hole. A crucial birdie on the par-5 hole 18 gave moved Crisologo into a tie for the lead at 281 (-7), with players like the Colombian Iván Camilo Ramírez and the Argentinean Leandro Correa climbing to the top during the round. Team Canada teammate Brendan MacDougall of Calgary finished T26 at 5 over par. In the women’s division, Team Canada Junior Squad standout Céleste Dao of Notre-dame-de-lÎle-Perrot, Que., cracked the top 10 in a tie for 9th at 4 over par. She was chasing champion María Fernanda Escauriza of Paraguay, who closed well clear of the pack at 12 under. Dao’s teammate Ellie Szeryk finished in 46th place at 31 over par.